You could almost wear these headphones swimming. A solid choice for athletic people requiring a secure connection, but audio quality is underwhelming for everyone else. Any athletic person will tell you horror tales of tangled wires and popped headphone cables as they attempt to listen to music on their iPhone 5S while running. Which is why stereo Bluetooth is such a perfect fit for active people. The catch is that quite often, Bluetooth headphones don't tend to work well with the sweat they invariably start to drown in when used during fitness or sport. Whether it's the salty liquid getting into the electronics components, or just having the earbuds pop out of your ears, Bluetooth headsets for runners haven't exactly set the world on fire. Aussie company BlueAnt Wireless is trying to overcome these obstacles with its Pump HD sportsbuds. 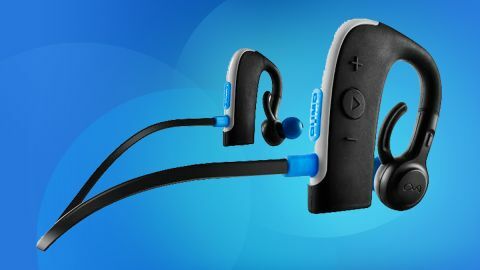 Rocking Bluetooth 3.0 for crisp, stereo audio and a waterproof, over-ear design, the Pumps are made for runners and other athletes who don't want to deal with the troubles of wired headphones. The Pumps aren't exactly revolutionary in terms of design - we've seen other behind-the-ear Bluetooth headphones before. But that's not necessarily a bad thing. The Pumps rest rest fairly comfortably behind the ear, with narrow extensions connecting to the earbuds that go in your ear holes themselves. Connecting the two earpieces is a fairly short, flat, tangle-free cable, which makes storing and transporting the headphones easy. Available in a variety of colour schemes, the Pumps are sporty in both performance and looks, which should help them appeal to the athletic crowd. Built with both kevlar and teflon in the speaker enclosure, and a smooth rubberised exterior, the BlueAnt headphones are fairly comfortable to wear and impervious to liquids. There's only a single covered Micro-USB port for charging the headphones, with three control buttons located on the right earpiece doing everything else. Because audio quality from in-ear buds comes largely from how well the buds fit in your ear, BlueAnt has stuffed the box the Pumps come with full of ear buds of different sizes. There are four small, medium and large attachments, plus a couple of "awareness tips" that don't block out external sound, and two sets of "stabilizers" designed to lock the earbuds in place in your ears. Even without the stabilizers, the Pumps feel secure when worn. But clip those extra bits of plastic on and these headphones aren't going anywhere. That's not an inconsiderable achievement, and something athletic types will be more than happy to hear. The stabilizers do make getting the earpieces in your earholes a touch more difficult, but the security of never having to worry about them falling out is definitely worth it. Also in the box is a cable tie for the cord behind your head. It seems like an unnecessary inclusion given the cable is fairly short anyway, but the fact it's in the box is a welcome addition. All of these extra attachments are important though, as having the right earpieces attached is essential. If you opt for an earpiece size too small, the buds are likely to go a little too deep in your ears. While wearing with the medium buds, my jaw would seal the earbud every time I swallowed, blocking the music I was listening to. Changing to the larger sized buds fixed the problem though, even if they did feel like they sat a little further out than I was used to. From a comfort perspective, the Pumps feel fairly easy on the ears for extended sessions, so long as the stabilisers aren't attached. When you do pop the extra plastic attachments on though, the headphones can get very irritable. Its' the price you pay for absolute security of connection though. Having the best fitting headphones leads to the best possible audio quality. But if you're looking for a massive range in a pair of compact sporty Bluetooth headphones, you're going to be disappointed. For their size and weight, the Pumps produce decent audio quality. Not great audio, by any stretch of the imagination, but decent. Bass is always the challenge with smaller earphones, and there's plenty of room for improvement on that front. Even with a perfect seal, the bass is understated, and without clear definition. The midrange, too, sounds a bit washed out. We tried the headphones with a range of music and there is a distinct lack of clarity in the mid range, while up top, it's decent without being spectacular. That may sound like the Pumps are akin to listening to cats shrieking through a tin can, but the truth is that the sound is passable. What's more impressive is that the headphones manage that sound while feeling secure enough to never fall out of your ears. Naturally, the Pumps also double as a Bluetooth handsfree device, allowing you to make and receive calls while listening to music. With only three buttons controlling both the music playback/volume and the call settings, remembering which combination of button presses does what is a challenge. We constantly put the phone into voice control mode when trying to skip a track by double-pressing the play button, for example. On the upside, battery life is pretty decent - BlueAnt promises 7-8 hours of audio playback, and we got around that number. For such a compact pair of headphones, that's a respectable number. We've tried plenty of Bluetooth headphones designed for active people that fall out of ears the second you move from meander to fast walk. The Pumps are incredibly secure in the ear, even without the included stabilizers attached. But when those stabilisers are attached, you could listen to music while falling over Niagara Falls in a barrel and they wouldn't fall out. They'd keep working even if you fell out of the barrel and got drenched thanks to being waterproof, which is another big tick. Frankly, audio quality is a bit disappointing. It's not exactly terrible, but compared to audio from Bluetooth speakers like the Plantronics BackBeat 903+, it was certainly underwhelming. The lack of physical buttons also adds to some control confusion. Given you'd quickly learn the various combinations over time, this is hardly a dealbreaker though. For athletes, there is a lot to love about these headphones – namely the fact that you can run/dance/basejump without ever fearing that they will fall off, as well as being able to wash them off after a workout. Battery life is good, and the Pump HD Sportsbuds are reasonably affordable too. But for all the benefits of a secure, waterproof fitting, the Pumps are left wanting in the audio quality department, especially given their 'HD' moniker. There are better sounding Bluetooth earbuds on the market, but not many that fit better. So you have to ask yourself: What's more important? A secure fitting or audio quality? If you answered the former, these are a solid choice.